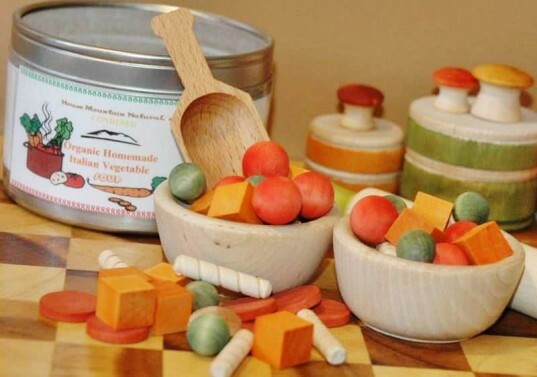 If you've been looking for a one-stop shop for beautiful, safe, eco-friendly and surprisingly affordable toys, you cannot go wrong with House Mountain Natural. House Mountain Natural is a wonderful Etsy shop run by a husband and wife team who work hard together in order to bring kids and parents a lovely selection of handcrafted quality Montessori and Waldorf inspired wooden toys. The range of toys you'll find in this shop is outstanding, with everything from counting toys to sensory toys to play kitchen food to blocks and much more. 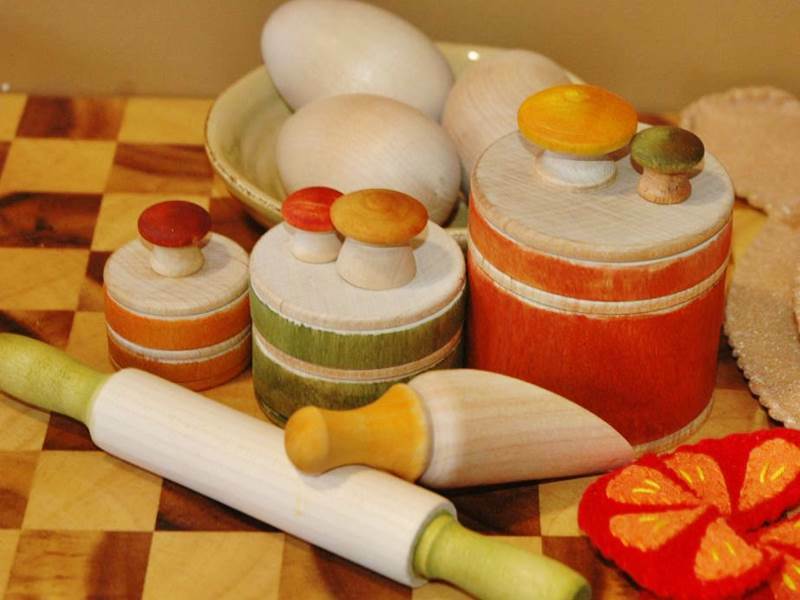 All toys are made with beautiful wood and hand-mixed, food safe water based washes in gorgeous colors, like what you see within the Montessori baking set shown above. All toys are sealed with a natural and exclusive blend of organic olive oil and local organic beeswax. The non-toxic finish is washable with just a little soapy water, so toys stay clean. Best of all, considering the safety and quality, you won't believe how inexpensive these toy sets are. Keep reading to see some of the best toys from this lovely shop. This is the cutest ever addition to your child’s’ pretend kitchen, restaurant or grocery store plus doubles up as a wonderful counting or sorting toy for your sensory bin. The set comes with a whole lot of soup fixings including 15 Rotini Pasta; 12 Sausage Slices; 12 Cubed Carrots; 10 Cherry tomatoes; 10 Peas; and 9 Baby Bella Mushroom Caps. You also get two nice soup bowls, a scoop for sorting and everything is packaged in a cute reusable metal can with clear lid. Please note soup ingredients range is size from ½ (peas) to 1 inch (pasta) so it’s not a toy intended for children who still put things in their mouth. I scream, you scream… well, at least I bet your kid screams for ice cream and now he can have some that’s sugar and drip free. This sweet ice cream shop play set includes one scoop each of vanilla, chocolate, strawberry and mint ice cream, 4 sundae cups and a sturdy storage box. Looking for a beautiful, all-inclusive baby warming gift that’s cute and affordable, not to mention useful? Yes? Then this Deluxe Baby Gift is just what you need. This gift makes the best baby shower gift and grows with a new baby to age three. 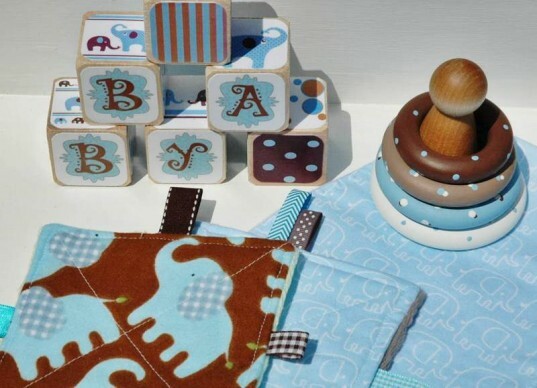 The set comes complete with a fun stacking toy that doubles as an all natural teething toy and an excellent early exploration tool, soft crinkle sensory tag toys, a matching set of 6 blocks and an always needed extra burp cloth. If you don’t need an entire gift set, this shop also carries some amazing sorting and counting baby toys made just for your youngest family members. Oh and although the baby boy gift set is shown above, they also offer a sweetly pink baby girl set or alien themed boy or girl set too! This cool counting cookie jar is preschool teacher inspired and designed especially to encourage counting, sorting, color recognition and more. You get one 4″ cookie jar and set of 6 cookies, each measures 2 inches across and 1/4 inch thick. The top of each cookie has bright “candy dots” one through six with coordinating number on back. Bonus, preschool teachers who would like to order 6+ sets for group activities can score a 20% discount. I’ve talked about my mancala obsession before here at Inhabitots, and this is a really cute and clever take on this classic game. Instead of the typical flat board mancala usually comes with, this version is played via sweet little bowls. 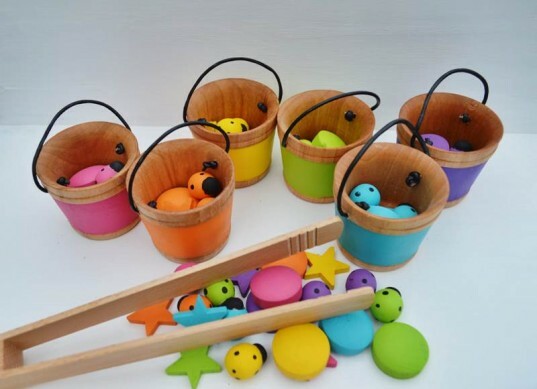 The set comes with 12 wooden bowls in all plus 48 peas to use instead of marbles and 2 cute needle felt wool pea pods. This is such a unique take on this fun family game! This is a really nice counting, color and sorting assortment of toys. Kids can use this set to learn about patterns, colors, counting, shapes, sorting and much more. The collection is brightly colored to delight little ones plus designed specifically to nurture child development through open-ended play. House Mountain Natural offers many different sorting collections and they all mix and match with the others. The set you see above comes with 6 friendly lady bugs, 6 bright stars, 6 circles and a set of bamboo tongs. You can get buckets (as shown above) or little sorting bowls separately. This is the cutest ever addition to your child's' pretend kitchen, restaurant or grocery store plus doubles up as a wonderful counting or sorting toy for your sensory bin. The set comes with a whole lot of soup fixings including 15 Rotini Pasta; 12 Sausage Slices; 12 Cubed Carrots; 10 Cherry tomatoes; 10 Peas; and 9 Baby Bella Mushroom Caps. You also get two nice soup bowls, a scoop for sorting and everything is packaged in a cute reusable metal can with clear lid. Please note soup ingredients range is size from ½ (peas) to 1 inch (pasta) so it's not a toy intended for children who still put things in their mouth. I scream, you scream... well, at least I bet your kid screams for ice cream and now he can have some that's sugar and drip free. 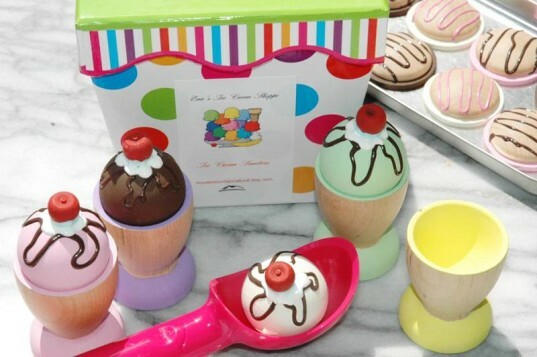 This sweet ice cream shop play set includes one scoop each of vanilla, chocolate, strawberry and mint ice cream, 4 sundae cups and a sturdy storage box. Looking for a beautiful, all-inclusive baby warming gift that's cute and affordable, not to mention useful? Yes? Then this Deluxe Baby Gift is just what you need. This gift makes the best baby shower gift and grows with a new baby to age three. The set comes complete with a fun stacking toy that doubles as an all natural teething toy and an excellent early exploration tool, soft crinkle sensory tag toys, a matching set of 6 blocks and an always needed extra burp cloth. If you don't need an entire gift set, this shop also carries some amazing sorting and counting baby toys made just for your youngest family members. Oh and although the baby boy gift set is shown above, they also offer a sweetly pink baby girl set or alien themed boy or girl set too! 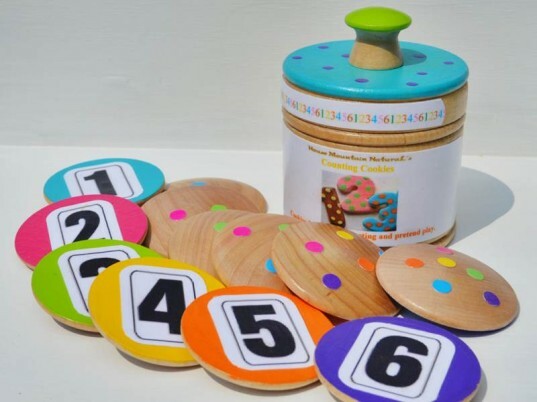 This cool counting cookie jar is preschool teacher inspired and designed especially to encourage counting, sorting, color recognition and more. You get one 4" cookie jar and set of 6 cookies, each measures 2 inches across and 1/4 inch thick. The top of each cookie has bright "candy dots" one through six with coordinating number on back. Bonus, preschool teachers who would like to order 6+ sets for group activities can score a 20% discount. I've talked about my mancala obsession before here at Inhabitots, and this is a really cute and clever take on this classic game. Instead of the typical flat board mancala usually comes with, this version is played via sweet little bowls. 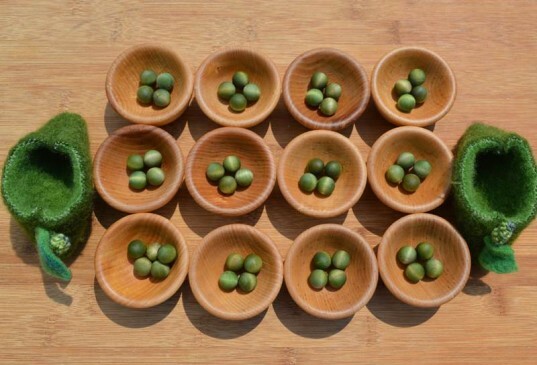 The set comes with 12 wooden bowls in all plus 48 peas to use instead of marbles and 2 cute needle felt wool pea pods. This is such a unique take on this fun family game!